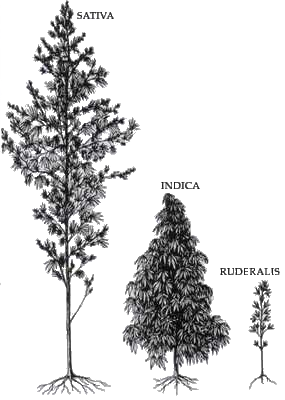 Three varieties of Cannabis (source-Wikipedia). I am based in Western part of India which has a semi-arid-coastal type of climate with The average maximum temperature during winter is 30 degrees Celsius while the minimum average temperature is 14 degrees Celsius. The maximum temperature in Summer could go up to 40 degrees Celsius while the minimum remains around 25 Celsius degrees. It gets pretty warm and humid during the monsoon months from June to September. I had asked a friend of mine who smokes Cannabis to save seeds for me. The dried Ganja that he used to get from his supplier, were allegedly from Rajasthan and appear to contain dried leaves, flower tops as well as some seeds. Clearly not a good quality but it became my source of seeds for planting. At first I just sprinkled them at random in my backyard where some garden plants were already growing. This backyard had been abandoned by the gardener and was subjected to trampling, desiccation as well as water logging. But after several months I saw that a couple of my seeds had sprouted. I would water them once in a while, being not too serious about cultivating Cannabis. However in spite of all the abuse and neglect three plants did survive to maturity but unfortunately turned out to be males. They grew almost 10 to 12 feet tall and from their physical appearance seem to be of the sativa variety/species.